There are still a few days to enter to win the Donnadots. Check them out and see how to win at Donnadot Giveaway! I haven’t had time much lately for projects that let me express my artistic side. I’ve been looking at some of my favorite projects today. One of the most fun projects I have done was for my mother and it was inspired by her Blue Danube dishes. 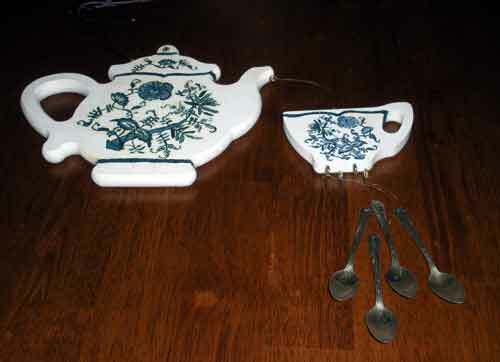 I love the teapot that goes with this set. So, I thought it would be fun to take the shape and the pattern and make a wind chime with spoons as the chimes. 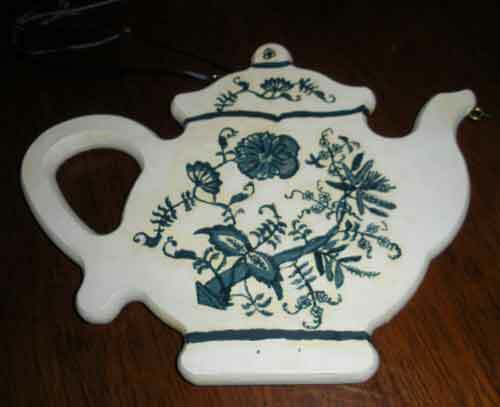 I took a wooden teapot form and cup that I found at a craft store and painted it white. 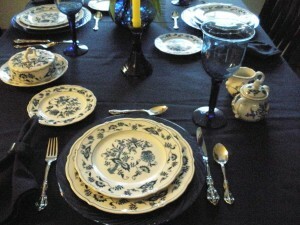 I then downloaded the pattern of the china from a picture of the plate. In photoshop, I reversed the image and lighted the lines and then printed it out on a laser jet printer. Did you know that heat will transfer what is printed on a page that was printed on a laser printer to a surface. Simply, place the printed side down on the surface and apply heat from an iron. The pattern transfers and then you go to the next step! The next step was to paint the pattern in. That part was pretty painstaking and detailed. After the pattern was painted on, I used a light varnish to seal it. 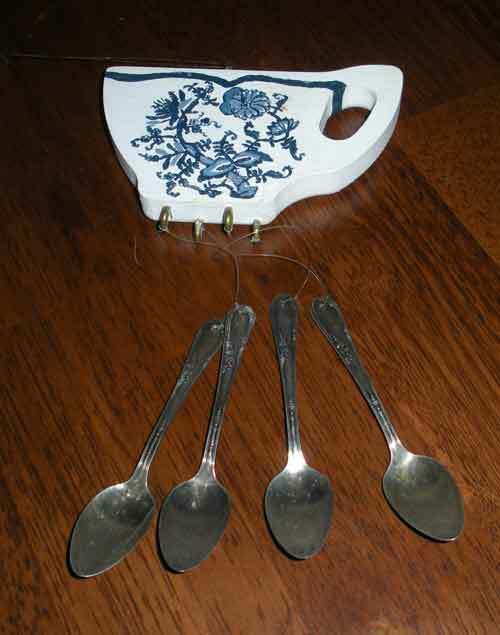 Then, screw some eye-hooks in the bottom, drill holes in some pretty spoons and then attache them to the painted form. 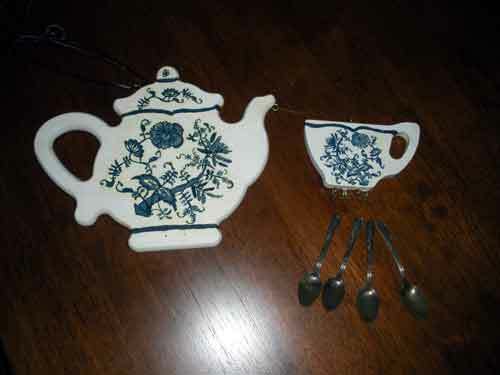 It was a fun project and mama has it hanging in her dining room next to the hutch that holds the Blue Danube china. 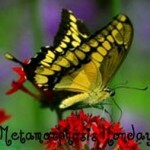 Can’t wait to see all the other fun projects over at Metamorphosis Monday and all the other blues at Blue Monday. Get your week off to a great start by checking out Blue Monday at Smiling Sally’s and Metamorphosis Monday at Between Naps on the Porch. Soothing ginger with a little cinnamon, mmmmm! Simmer water, ginger, and cinnamon sticks in a pot, covered, 1 hour. Strain through a sieve into cups a serve with honey. awww thats really cute 🙂 thanks for idea! Great post. I am out doing some blog hopping with the Blue Monday participants. Stop by if you have time and see mine at http://jeanstockdale.typepad.com. 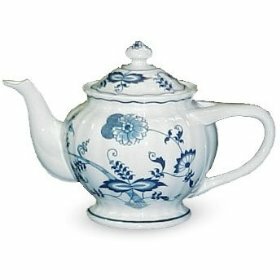 Your mother’s Danube set is just lovely. You did a wonderful job with that windchime. I have done the transfer with clothing, but never tried it on anything else. Thanks for the tip. Your dishes are just very pretty!! Great project…I love the Blue Danube pattern. My son said That’s so gross, find out why. This is so creative! Happy Blue Monday. There’ve been a few problems this morning, and I don’t think you’re linked. Please come back and link in. Wow! Definitely saving this idea-wonderful job! Very clever with the laser printer. I did not know that. I thought folks used special inks in inkjets for tranfers. Well, I guess they do but that ink in expensive. Thanks. Learn something new every day! Cute idea. Very well done and I didn’t know about the transfer process !